Although never having danced as a child, ballet always held a special place in Hollye’s heart. Shortly after moving to East Mesa, Hollye discovered Studio R Ballet’s adult ballet classes taught by Ms. Robbin. Although brand new at ballet, she loved every minute and found Studio R Ballet to be a wonderfully supportive environment. 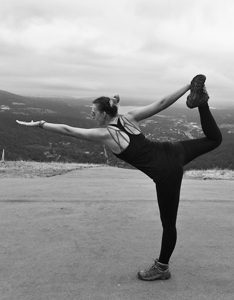 Learning ballet as an adult has given Hollye a fresh perspective on a dancer’s needed strength, flexibility, and alignment. This allows her to create classes that differ each week to engage key muscles while continually advancing flexibility. Hollye continues to take adult ballet classes with Ms. Robbin and Ms. Rachel in addition to once-weekly beginner pointe classes. Outside of Studio R Ballet, Hollye teaches yoga full-time in the East Valley.